In order to create a fun and safe race, the implementation of these rules is for your protection. Muddy Duck Dash is a rain or shine event. In the case of dangerous weather that threatens the safety of participants or staff, the event director(s) reserves the right to postpone or cancel the event. In the event of a cancellation, there will be no refunds or transfers. The Muddy Duck Dash will still make donations to its charities. All participants will adhere to the instructions given by the race director, race staff, volunteers, and medical personnel. Runners understand that this race is high-adventure and accept all risks associated with the event. Participants must be physically able to complete the event. Strollers, wheeled carts, bicycles, skates, or other mobile devices are prohibited from the race. Registration is closed approximately 10 minutes before race time. All participants must sign an event waiver before competing. NO TRACK SPIKES or heels please! Muddy Duck Awards and Schwag! Each participant will receive a Muddy Duck Dash technical shirt, finisher medal, as well as their very own rubber duck (details below). We are not formally timing the event, but will have a running clock. We are stressing this event as a fun experience with a less competitive approach. YOU MUST RUN IN YOUR ASSIGNED WAVE! The race will take place in a succession of waves that begin every 10 minutes. The first runners wave will run at 8:00am. Each wave will have about 100 runners in that race. Wave selection can be chosen at the online registration page. Completion of all the obstacles may be hazardous to participants. It is the individual’s responsibility to judge whether or not the obstacle is too dangerous. It is the runner’s responsibility to notify a course official if an obstacle is too hazardous to complete. You must carry your duck at all times during the race! We kinda see it as your duck is racing, and you are just transporting it to the finish-line! Your duck can only complete the course on your person. Take care of your duck, love it, care for it, and help it get to the finish-line! It must be in your possession at all times! Your ducks are very sensitive and loving. Please treat them with care and respect. Throwing, biting, kicking, or hurting your duck is strictly prohibited. Ducks must be in your possession at all times in order for them to be protected. You must finish the race with your duck in order to be counted as a legitimate finisher. Runners should wear running shoes and dress appropriately. No track spikes are allowed. Please be aware of other participants at all times. Be safe, and use caution at all times. This event takes place on uneven terrain. Volunteers will be stationed throughout the race in order to assist a runner. 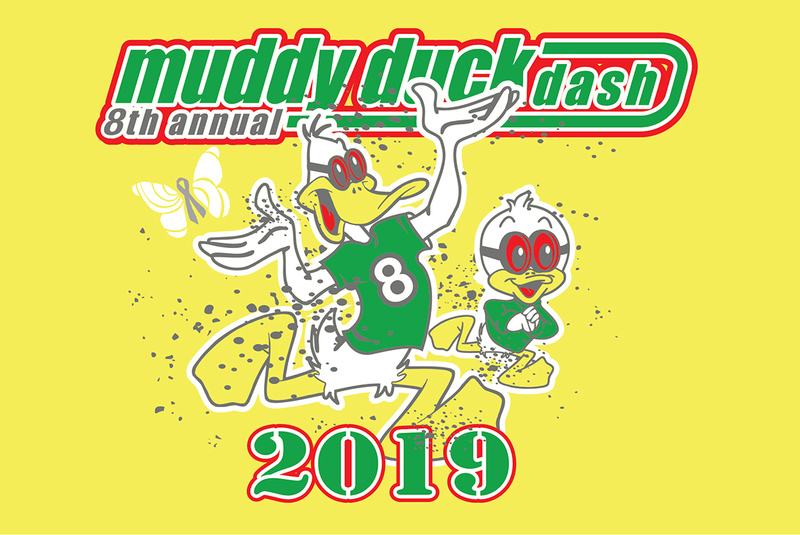 Runners assume all responsibility for medical expenses as a result of participating in Muddy Duck Dash, including but not limited to hospitalization, ambulance transportation or physician services. Be respectful of all runners on the course at all time for every one’s safety and in the interest of good sportsmanship. Participants are encouraged to decorate their duck prior to the event start. Paint it, dress it up, Sharpie it, etc. Be sure to include your race number as part of the decoration! Race Day Parking: Once on campus and after passing the Martha Nesbitt Building, turn left on Facilities Drive, and park in the upper deck of Parking Deck #1. Then take the stairwell down to lower deck for registration. Volunteer Parking: once on campus and after passing the Martha Nesbitt Building, turn left on Facilities Drive, and park in the “V Lot”. WHERE: Once on campus and after passing the Martha Nesbitt Building, turn left on Facilities Drive, and park in the lower parking deck (near Nesbitt Building) on the UNG campus. This is also the race start line location. *All race participants will receive a color-coded tyvek wristband associated with their particular “wave”, a runner bag, a race-day shirt, and rubber duck at packet-pickup. Is there an age limit? Can kids for it? Kids are certainly welcome!! Here are the age breakdowns for the races! Check out our Registration page on our website. QUACK QUACK!! What sort of obstacles are planned? I’m assuming mud because of the name of the race, but what else? We will reveal more information on the obstacles the closer it gets to race day. 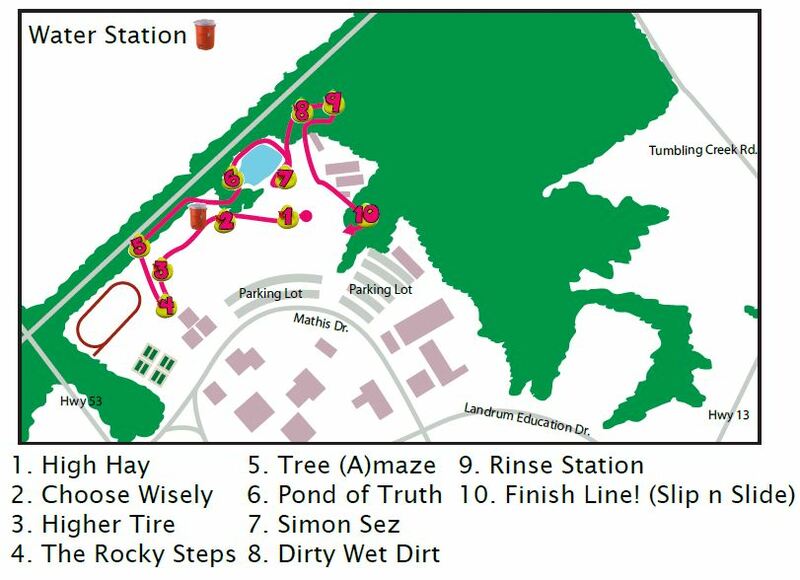 The course is an easy to moderate 3.5 mile challenge course with 12-15 various obstacles! Will the younger age groups gets awarded for the top 3 finishers? The younger age groups will be given finisher awards for completing the race. When are you going to release more about the obstacles? $45 April 11-April 27 **Online registration closes at 5:00pm April 27th. $50 Race-day **Day-of registration open from 7:00-7:50am April 28th at registration in packet pickup area. Does the Duck Dash 10-12 and Little Duck Dash have obstacles? Hi Jeff… Thanks for the quick reply. I should have been more specific. What are the age brackets for the Muddy Duck Dash? Or is there only one group of 13+ and no individual age brackets? Do the 10-12 year olds go through obstacles as well? Yes, the 10-12 year olds will go through obstacles as well. Are there a few obstacles on the one mile “duck dash”? Yes, there will be obstacles on the one mile duck dash. Check out our race maps on our schedule and course map page! When do you pick your duck up? Can you pick it up early? *All race participants will receive their race number, runner bag, performance shirt, and rubber duck at packet-pickup. Can someone else pick up your packet? ATTENTION: Change has been made on Packet Pick Up Schedule. Packet pickup will be on Friday, April 27 from 12:00-7:00pm. You can also pickup your packet on race day morning as well between 7:00-7:50am. Sorry for any confusion or inconvenience. Please let me know if you have any questions! When does race day registration for the Little Duck Dash close? At 7:50 am with the other registrations or later? When does registration open for the 2013 event? I want to be a part of all of this fun experience! We are working on details and hope to launch on Active.com within 2 weeks. How do you register as a group? Thanks for the inquiry! Can you mail the entries as a group? If so, I can provide an address. It will save money per entrant. How many in the group? How many for a group? Where to send registration? Do you have a group you want to register, am I understanding correctly? If so, you can mail them in together. Will that work? There is a printable link on the registration tab. If so, I can extend the $35 price past the dealine on Saturday, I just need to know what to look out for in the mail and when they will be arriving. I didn’t realize until after registering myself and my boyfriend that we needed to bring the signed waivers with us when we pickup our race packets(we’re newbies to races!) Now the website I registered on will not let me go back and print the waivers since I didn’t sign up for an account with them. We signed the online waivers. Is that good enough or will you have waivers there to sign? That should be fine. Thanks for supporting the event! What’s the start time of the kids’ races? Trying to figure out if we’ll be able to see them if we’re competing in the main race. Thanks. The adults should all be finished by the time the kid’s races begin. We estimate about 9:30-10am. I have signed 2 people up and was wanting to sign another 3 people up and didn’t know how to get the group discount. Can you please let me know as soon as possible because the price goes up after today. Can my 11 year old daughter run the 3.5 if I run with her? She can handle the mileage without a problem. Absolutely! My 9 year old is doing the 3.5. I am running this with my thirteen year old and am a little concerned about the electric wire crawl, I am assuming it isn’t too harmful if you are letting thirteen year olds and up do it but just wanted to check on the details of this particular obstacle. Is the race spectator friendly? Will I be able to “follow” the runners along the course and/or see them complete obstacles? Many of the obstacles are very visable! Once runners head into the woods, they will not be visible though. I’m trying to register for myself and my 11 year old to run the 3.5. I know you mentioned in the above comments that it’s possible for kids to run with parents; yet, how do I register her? The link won’t let me do it because she isn’t over 12. I wonder what happen to the awards? There was none..
We only do top three overall. This race is about having fun. Results are posted although they are off in many places because so many people ran in wrong heat. Doing so ruined the race results for those that ran in the correct heats. Not our fault, but frustrating for us trying to sort it all out. Caused delays beginning the kids races. I have a 6 year old that would like to do the 1 mile instead of .5 is that possible?? Also if we are watching from the side can we bring our dog if campus policy approves it? My brother and I have signed up to run on Saturday, but he registered a bit earlier than I did. I would like to run in the same wave as him, but I’m sure, based on our registration dates, he’ll be in a different wave than me. Is there any way you can change waves or run in different waves if there are enough spots left open?